You&apos;ll find lots of reasons to fall in love with Hendricks County, but one of my absolute favorites is the food. Local eateries serve up some delicious specialties that you can only get during the autumn season. If you are looking for a cool treat with the taste of fall, you have to try the handmade pumpkin spice milkshake at the Mayberry Cafe in Danville. It&apos;s a sweet, delicious treat that is full of creamy goodness. If you prefer a warmer fall treat, the cafe&apos;s popular bread pudding has returned to the menu and will be available all winter. Another option for a chilly snack is the pumpkin spice ice cream at Danny&apos;s Mexican Ice Cream in Avon. Mexican ice cream provides a unique blend of quality ingredients and rich flavor. If you love pumpkin pie, you will love this homemade ice cream. Try it in a waffle cone! Locals can&apos;t wait until after Labor Day when Bread Basket Cafe and Bakery rolls out their fall creations. And their pumpkin torte dessert has to be at the top of that list. It includes four layers of pumpkin cake separated by layers of a fluffy cream cheese, pumpkin and whipped cream concoction that they drizzle with caramel sauce and top with roasted pecans. Another favorite -- their Harvest Moon pie -- always makes me think of fall and Thanksgiving. Filled with a blend of apples, apricots and cranberries, this pie delivers the perfect blend of sweet and tangy. All Bread Basket&apos;s pies are handmade in-house. Order any of their desserts for your Thanksgiving meal and you&apos;ll be everyone&apos;s favorite guest! Donuts are by far my favorite sweet treat, and Reds Donuts in Danville is one of the best spots in Hendricks County to find them. 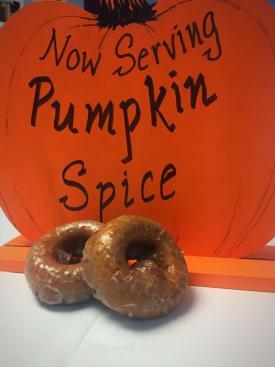 Their pumpkin spice donut is great on its own, but I love it with a nice hot cup of coffee on a cool, fall morning. The Beehive has become one of my go-to places to get a latte and dessert, and their fall lineup makes an already great selection even better. They offer a pumpkin spice latte to wash down their pumpkin muffins, pumpkin cheesecake or brown butter pumpkin cake. What did I miss? What are your favorite fall treats in Hendricks County? Let me know in the comments!